Say goodbye to morning sickness and a queasy tummy. Contains a full 10mg of vitamin B6 and powerful essential oils and plant botanicals proven to relieve nausea and queasy stomach due to pregnancy, labor medications, vitamins and supplements, even post-anesthesia and surgery. This is our strongest product available for relieving morning sickness. Our products are all-natural, drug-free and chemical-free so its 100% safe for mom and baby. Finally an alternative to traditional old saltine crackers or thick cola syrups. Great tasting, fast-acting and highly effective at combating your nausea with no side effects. No artificial flavors or colors. Alleviates dry mouth during labor and provides a quick energy boost. Also makes a safe, more effective alternative to plain ice chips or gum. Each piece is individually wrapped for convenience so they are perfect to take along in your purse, labor bag, pocket, diaper bag, luggage, computer bag, briefcase or to always keep handy in the glove compartment of your car. Goes to work immediately on your upset stomach. Recommended by doctors and healthcare professionals. A container of our most effective assorted flavors of sour raspberry and sour lemon infused with 10mg vitamin B6 per lozenge for extra-strength nausea relief. 21 individually-wrapped lozenges per container. 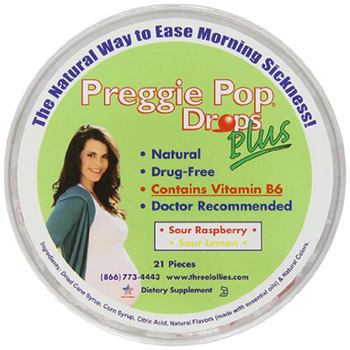 See all our three lollies products: Preggie Pops and Drops for strong morning sickness relief; Preggie Drops Plus with 10mg Vitamin B6 for extra-strong morning sickness relief; Organic PreggiePop Drops made with USDA certified organic essential oils; Queasy Pops and Drops for all-purpose nausea relief due to sickness, traveling, car or air travel, pregnancy, morning sickness, medications, even chemotherapy and post-anesthesia; Queasy Drops Pink Sour Raspberry that supports breast cancer awareness and provides quick, strong nausea relief from chemotherapy, anesthesia or cancer medications; And our special line just for kids, Queasy Pops Kids.